You need to believe me when I tell you I am having a tremendous amount of difficulty in describing this article of clothing that I found in the children’s department at Target on Saturday. I mean, where do you even start. Let’s just start with what it really is: a blue dinosaur eating a plant. And then you figure out the rest. Indeed, here does come trouble, as if we needed that degree of specificity. 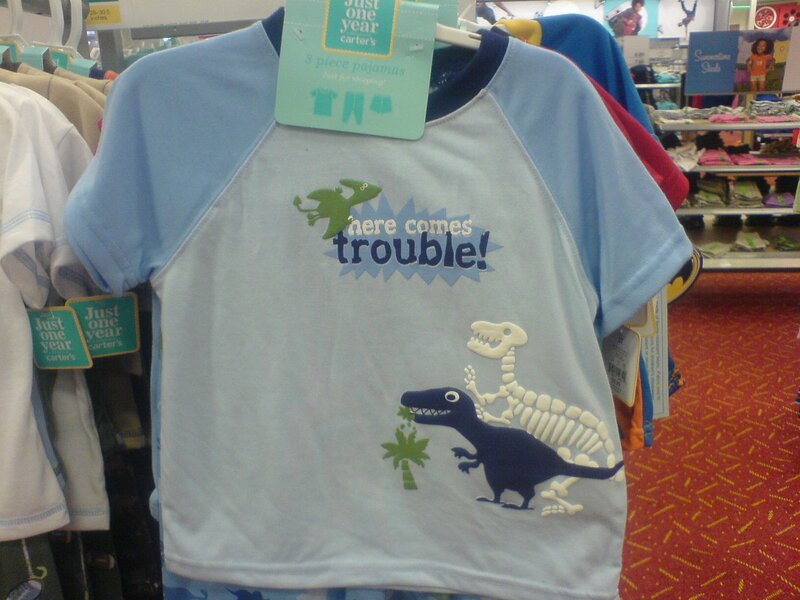 Clearly the work of an ex-Spencer’s Gifts garment designer, this toddler shirt should never, ever have made it to so many levels within the company that produced it, let alone production, let alone a retail store, let alone shirt #1 on a rack display on the floor of the children’s department. What a sickening indictment on a society of self-centeredness, where children are reduced to billboards tasked with the propagation of adult humor. Their helpless little bodies and minds unsuspecting, they are left to bear unspeakably explicit imagery and innuendo; unwitting beacons of mature subject matter. I truly feel sorry for the youth of the nation. First they are stripped of social security; now, their dignity. Tell me you bought that for Joaquin….